All-on-4 are a revolutionary new technique that allows for an entire arch of damaged or severely decayed teeth to be replaced with dental implants in just one visit to your dentist. Dental implants are quickly becoming one of the most popular solutions for patients who require tooth extraction, or who have teeth that have fallen out. In either case, tooth loss is usually a result of extreme decay, or a trauma or injury. Unfortunately, missing teeth can have a significant impact on the way our mouth functions, making it harder to eat certain foods and in some cases, also impacting the way in which we talk. A gap in your smile can also seriously affect your confidence. All-on-4 dental implants are an implant-supported bridge. The bridge has multiple titanium posts that are inserted into your jaw at predetermined points. The visible portion of the implant is constructed from the highest quality material offered today, Prettau® Zirconia. Color-matched to any existing teeth, All-on-4 dental implants can transform your smile and restore your confidence overnight. Am I a suitable candidate for All-on-4 Dental Implants? All-on-4 dental implants are an ideal solution for patients who are missing all or most of their teeth in their upper/lower jaw, or those who have a removable prosthesis, but are frustrated with the limitations that it offers. Before you can book in for your All-on-4 implant surgery, you will need a comprehensive consultation with your dentist to ensure that the solution is right for you. Why are All-on-4 Dental Implants Better than Dentures? Secure. Implants are a permanent solution. Once they are in place you can eat and drink what you like, laugh, cough, sing, kiss and even sneeze, and they will not move an inch. Comfortable. Unlike dentures, which are known for rubbing the gum and making it sore, implants are so comfortable that it won’t take long before you forget that they aren’t your natural teeth! Discreet. 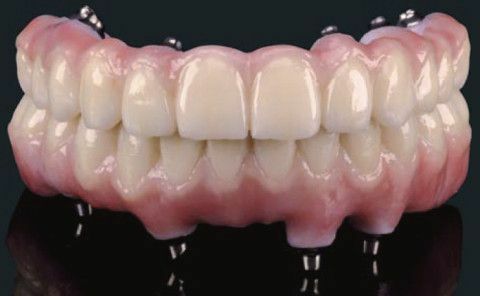 Dentures sometimes have to be removed in order to perform certain activities. Implants are permanent and so offer the ultimate discretion. No-one will know you have had implants unless you choose to tell them. It also allows people to grow older with more grace and dignity. Beautiful. The All-on-4 dental implants are created using the finest quality material, Prettau® Zirconia. This material is currently cited as the best on the market in terms of both functionality and aesthetics. It is extremely durable, being highly resistant to chips, cracks, fractures and staining. The finish is extremely smooth and available in an extensive range of aesthetic stains and glazes, giving you a smile you can be confident sharing. The fastest transformation. Standard dental implants require multiple visits to your dentist’s office over a number of months. However, All-on-4 dental implants can be created overnight, meaning that you can transform your teeth in just one day. Prettau® Zirconia has been used with tremendous success in Europe during the last five years, and now it is available here in the U.S. If your smile is getting you down or you have a prosthetic advice that is compromising on your lifestyle, enquire with your dentist about All-on-4 dental implants. They really could transform your life.